A stained glass window, "The Risen Christ" commemorates those who died in service or were killed in action in World War One. 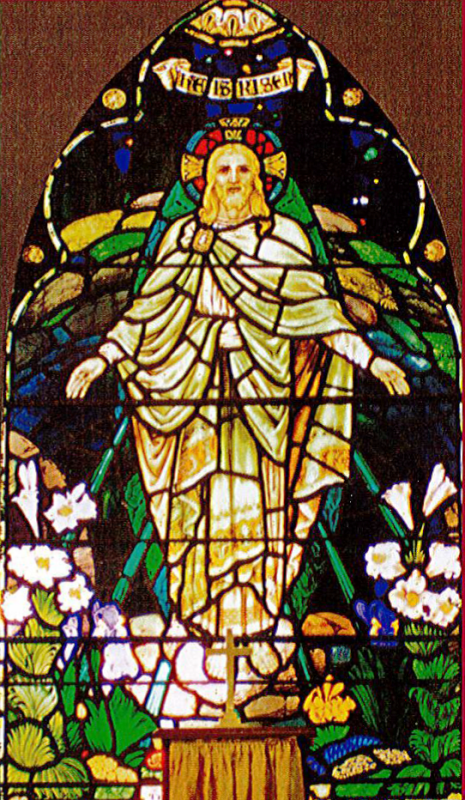 The window shows the Risen Christ in front of the tomb, and is surrounded by English Easter flowers. The window was originally installed in the front porch of the old church. To the Glory of God and in grateful remembrance of all who died in the Great War 1914 - 1918. In honour of almighty God and in memory of those who made the supreme sacrifice in the Great War 1914 - 1918. The East Window of this church was given by the members of the Ladies Guild & St. Hilda`s School.